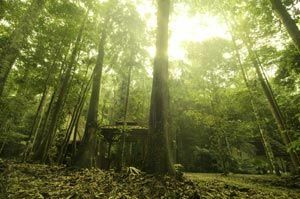 The Forest Stewardship Council revealed this week that any sale of illegally-sourced Asia Plywood produce from Wickes and B&Q was done "in good faith" as the supplier failed to inform them that its FSC certification had been revoked. A recent Daily Mail article accused B&Q and Wickes of continuing to sell wood 'felled illegally from [a] Borneo rainforest' despite an investigation by the Scientific Certification Systems (SCS) finding Asia Plywood in breach of sourcing rules. In response, Wickes said it was "disappointed with the recent allegation in the Daily Mail that it is selling illegal timber in breach of standards." While the retailer has stopped sourcing from the rogue supplier, it is still selling its remaining stock of the controversial product to save the environmental cost of wasting it and sourcing more wood to replace it. B&Q was also quick to deny any wrong-doing, saying it had taken action as soon as "a potential supplier accreditation issue" was brought to its attention in early December last year. The article went on to question the FSC's involvement, saying the body had continued to authorise sales of the hardwood until its certification ran out in December, despite the SCS advising that none of its products made since February 2011 should have been sold. According to the FSC, an investigation by SCS in December 2011 revealed Asia Plywood had failed to provide adequate evidence of the certified origin of the wood use in FSC Mixed products and supplied to retailers, including B&Q and Wickes. The FSC says that as a result Asia Plywood's certificate was terminated and the SCS demanded the company contact all buyers to inform them that all products bought between February and December last year were not in compliance with FSC rules. Furthermore, the authority says it requested Asia Plywood follow up with its customers to remove all references to FSC from stock purchased from the company and sell the wood only as uncertified. According to the FSC, Asia Plywood did not inform B&Q, Wickes or any other customer of the change in scope of its certificate, as was required by its certification contract. The FSC told DIY Week that Asia Plywood's actions represented "a rare misuse of the FSC system by one of its certificate holders." B&Q said it had pulled all Asia Plywood stock from its shelves on Friday, January 27, which is when the FSC trademark license for the supplier was terminated by FSC International. A spokesperson told DIY Week: "We were alerted to a potential supplier accreditation issue regarding plywood on December 7 2011, and immediately took action. We had sourced a small amount of product from this supplier from October 2011 and as soon as we were made aware, all future shipments of this plywood were immediately cancelled. "We sought and received written assurances from FSC ... as recently as January 13th that B&Q's current stock is FSC certified, which remained valid until potential further information came to light on Friday, January 27. "As a result we launched a further investigation and, while this is underway, we have taken the decision to remove any existing stock of this plywood from our shelves from Friday, January 27. We have done this because we are proud of our heritage in this area and are committed to ensuring that our customers can be assured there is no doubt whatsoever about our supply chain." Wickes, meanwhile, told us: "[We] have not purchased any product from Asia Plywood since we were made aware of the withdrawal of its FSC certification on December 15 2011, at which time we re-sourced to an alternative supplier. We believe that the right course of action and best for the environment is to sell through the remaining product rather than scrap it and manufacture and ship more to replace it. "All of us in the timber supply chain have a responsibility to work in a collaborative way to ensure that, if things do go wrong, information is shared quickly and accurately so that the standard remains an effective assurance of best practice." You may by now know about the problems I have had with Wickes kitchen products. Your colleagues Robyn, Chris and Jason (Bletchley MK) have knowledge of the full details. The first problem we had was one of the corner units that was delivered was the wrong type due to a mistake made by the kitchen designer, and will take more than a week (10/07/12) to have it replaced, I was also asked to take this one into your store which I have done at my expense. Then our kitchen fitter discovered that the amount of worktop we were delivered was not enough to complete the job. I phoned and asked to speak to Jason but Robyn said he was not available it was his day off. When I explained the problem to Robyn she did not apologise but instead told me that I needed to pay for the new length of worktop, it was then when I realised how poor your customer service was and the mistake we made purchasing our kitchen from Wickes. I had then to explain to Robyn that this was not the fault of mine but Wickes as the measurements were carried out by Jason and I will not pay any more money. She then said she will phone me back shortly she needed to look into it in more detail. About an hour later still no call back, so I phoned back there was no answer, tried again later was told by one of her colleagues she was busy with a customer but would remind her to phone me, but once again I had to phone up, Robyn answered and told me the deputy manager Chris is dealing with this issue and will speak to me. Chris phoned me and explained that it was probably a computer error that caused the measurement mistake and he would send out another length of worktop and I will not be charged. I explained that I need the worktop ASAP as the kitchen fitter has priced the job up to take a certain time, Chris said he would phone me back later before 2.30pm he needed to source the worktop and have it express delivered to me, he phoned me back, It was just before this call-back from Chris, our kitchen fitter found yet another problem, the tape edging for the worktop was the wrong colour, so I needed to come in and show him. When I arrived at your store and met Chris he told me there must have been a production error as the product name was the same on the worktop label and the edging label, he then told me he will ring me to let me know when the items could be delivered, we later had a call from Robyn to say the earliest it would be delivered was Tuesday 10/07/12. This will mean the kitchen fitter will need to be paid MORE MONEY for the job to be completed. I do expect to be compensated for these errors Wickes have made. I await your response in writing within 7 days or I will take this further and contact your area manager. Since first writing this letter I ve still not had the faults sorted out. I m totally fed up with your products and your customer service. You can come and pick up this rubbish you advertise as a kitchen I want a FULL refund. It is the responsibility of the buyer to check that their suppliers certificates are current. This is easily done on the FSC website. Any other company would have had their certificates suspended for such a poor system.